If you’ve been going to gym for awhile, you’ve probably seen people who do hundreds of crunches a day but still have belly fat. That’s because crunches don’t work! This classic exercise only targets one small abdominal muscle group, but has little impact on your obliques and rectus abdominus (six-pack muscles). To get ripped abs, eat clean and train your core from different angles. Focus on compound movements that build stability and balance, such as the squat, push-ups, deadlifts. Hanging leg raises, air bicycles, ab rollouts, bent-knee hip raises, and weighted cable crunches are far more effective than traditional crunches. Don’t forget about cardio, which melts away fat and tones your ab muscles. The same goes for ab machines. This kind of equipment is completely useless. For best results, do bodyweight exercises for abs. One of the biggest benefits of doing squats is that it helps improve stability and balance. When using the Smith machine, your muscles don’t have to work as hard to stabilize your body. This piece of equipment will only put stress on your knees due to decreased activation of the hamstrings. If you can’t go heavy when performing regular squats, use smaller weights. Squatting with a light load will do more for your body than using the Smith machine. This exercise isn’t necessarily useless, but rather dangerous. It puts pressure on the rotator cuff, a small muscle group that helps stabilize your shoulders. This can lead to injuries, debilitating pain, and strained muscles in the neck. Pressing weights overhead from the front is much safer. Unless you want surgery, stick to military presses, dumbbell shoulder presses and other exercises that produce similar strength gains. Partial squats are often responsible for a weak core and posterior chain. This exercise also causes sore knees, ACL (anterior cruciate ligament) tears, and imbalances in the quadriceps to hamstring strength ratio. It doesn’t even activate the hamstrings, glutes, and adductors. So, if you want to build muscle and strength, do full squats. Studies indicate that the hamstrings, quads, calves, and glutes are all maximally trained as squat depth increases. Squatting all the day down will increase your range of motion, fix muscle imbalances, and improve functional mobility. 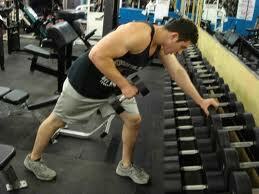 Using the lower back extension machine is a surefire way to waste your time. This piece of equipment will do nothing for your back muscles and can even lead to injuries. The motion is totally unnatural and puts unnecessary stress on your back. And no, this machine doesn’t burn fat off the lower back and abdominal area. The abductor/adductor machine is just plain useless. It basically forces your legs to open and close, putting stress on your iliotibial bands and hip capsules. Squats and lunges, which require balance and stability, work your adductor and abductor muscles much better than those isolation moves. In general, this machine is preferred by women as a way to melt the fat off their thighs. Spot reduction is just a myth. If you want to tone your inner thigh muscles, do squats. Not only you’ll save time, but also get results from your workout. Training your triceps at this machine is a waste of time. To complete the lift, you’ll be mostly using your shoulders and back muscles, so the impact on triceps will be minimal. This is one of the most useless exercises out there, so find better alternatives like triceps dips, skull crushers, close-grip EZ-bar presses, and kneeling cable triceps extensions. How many times did you see the big guys at the gym doing triceps kickbacks? I bet you can count it on your fingers. This exercise is pretty useless, even for women. The problem is that it doesn’t allow you to lift enough weight for getting results. If you use heavy loads, your form will suffer. The upper arm will begin to sag towards the floor, robbing the exercise of its effectiveness. Doing more reps with light weights won’t help you either. No one ever built huge triceps doing hundreds of reps and sets with a tiny dumbbell. Skull crushers are way more effective than triceps kickbacks.